The hospital grounds are clearing up and patients are being discharged. 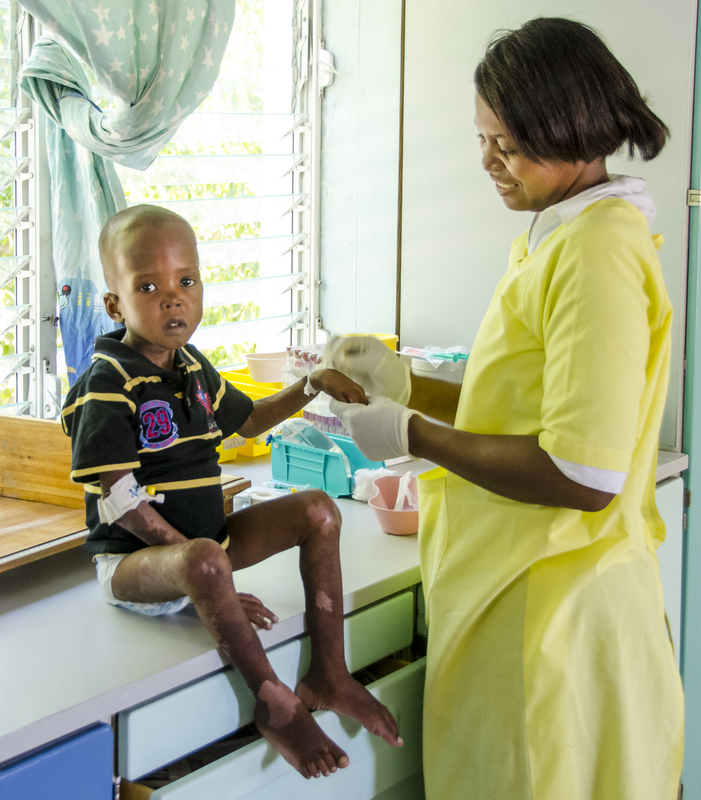 Today there were more than 60 patients in the outpatient clinic. We have also sent some adult patients to another hospital site more suited for their care. A group of visiting physicians went with them to work for the day at their site. We are also working on getting spinal cord and neurosurgical cases to the USS Comfort. A surgical team prepares to operate. We have four surgical teams from the US and Italy. These are complete teams that work 24-hour shifts. There are two major ORs and a small room transformed into an OR. They are still doing amputations. 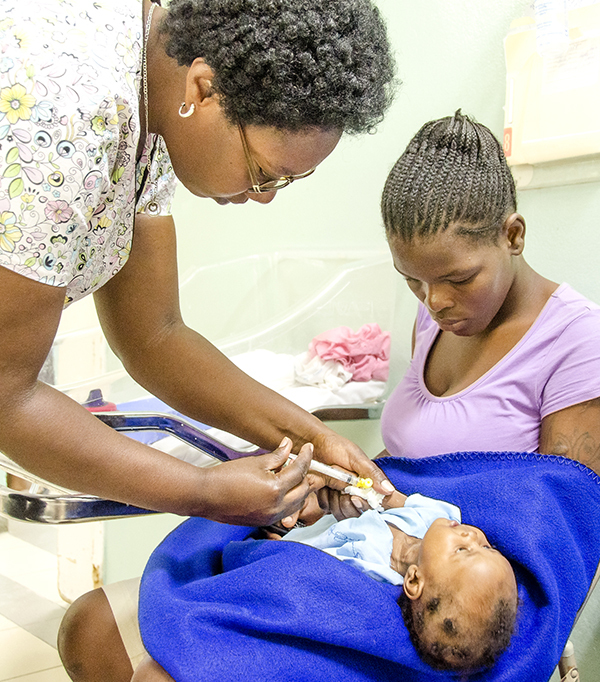 Our local hospital staff is working on getting back to pediatric care. In collaboration with St. Helen, we brought children down from Kenscoff. This effort was important so they could see the work that the hospital is doing and to share with their peers because they are very far removed. One medical team provided medical care today for 40 patients living in one of the many makeshift camps. They are not really a camp but thousands of blankets connected with wooden sticks to try and protect them against the wind. They have no food, no water, no sanitation and no medical care. These camps are a big concern to all organizations. The St. Luke Outreach team is working on going out into the community to distribute water and they are discussing strategies about combating possible future outbreaks of disease. If the rains come these tent cities will be washed away. We have an average of 80 volunteers excluding the Italian civil defense. 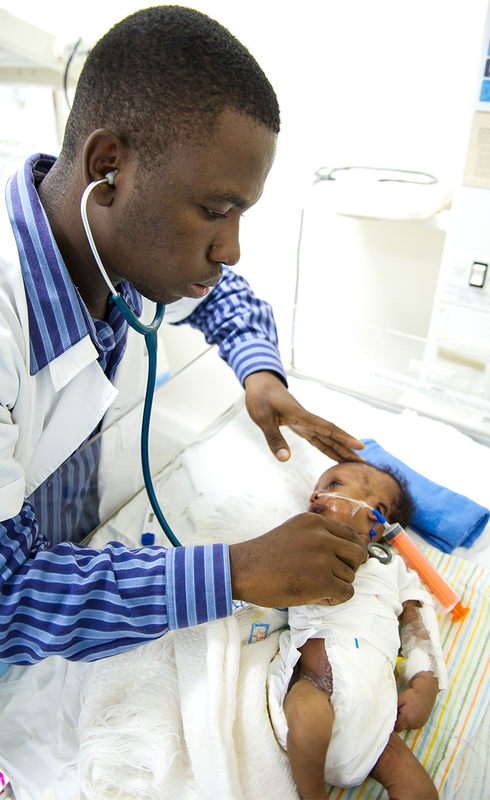 Many of the volunteers are surgeons and physicians. We were very happy to receive surgical support from the first group of volunteer nurses. We appreciate all volunteers because the hospital staff is functioning at half capacity. Many staff have lost their homes, or family and have not been able to return to work. We do not have an exact number of missing staff. We have a 35-year old man that arrived positive for tetanus and has severe, deep wounds. Having tetanus can result in convulsions when exposed to light and sound. This patient was located in the ER, which is quite loud and whenever someone was shouting, he then started to convulse. 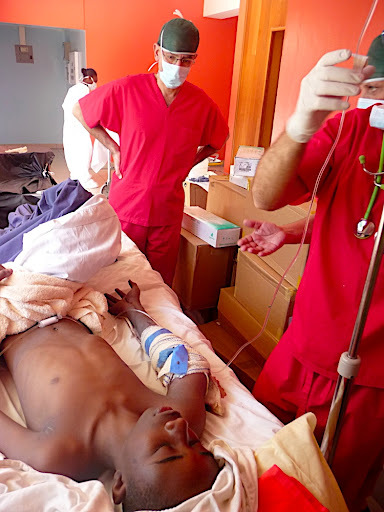 He was treated with Valium, but continue to speak to everyone in English saying, “please help me”. In most countries, tetanus is easily preventable. A single shot vaccine. Today we received a tetanus shipment from the WHO so we are now able to vaccinate all in-coming patients. Channel 5 from Italy visited us today along with two Italian newspapers. Robin had a radio interview with a station in St. Paul, Minnesota. Patients in the courtyard of the hospital. Marco Randon from Italy assists in managing the bakery at Francisville, the lot adjacent to the St Damien complex. They are baking 5,000 rolls a day for distributions and the people are reporting that it is a miracle to smell such a wonderful aroma. This effort helped immensely in the very first days when supplies were short and continues to help. The walls at the car mechanic workshop are damaged, but all the machinery inside is safe. Paolo Basso from Italy is helping with repairs and maintenance, when not busy downloading supplies or giving support at the hospital. The warehouse at Francisville is becoming the main hub supply and temporary home for the Italian civil service including their helicopter-landing site.